You'll be £5.20 closer to your next £10.00 credit when you purchase Romford in the Great War. What's this? Romford in the Great War tells the remarkable story of Romford and its surrounding areas from the outbreak of the Great War in 1914, to the long-awaited peace of 1918. Romford had a considerable military connection during the war. The area was largely associated with the famous Sportsman's Battalions, the 23rd and 24th Battalions of the Royal Fusiliers, that, as the title suggests, was made up of well-known sportsmen of the day. Initially, the battalion stayed at Hare Hall camp in Romford and Grey Towers Camp in Hornchurch, respectively. The equally famous Artists Rifles took over Hare Hall after the Sportsman Battalion left, and went on to become a renowned officer training corps. The book takes a detailed look at the district's war memorials and rolls of honour, that commemorate the names of the local young men who answered the call to arms to protect their king and country. Wynn explores some of these names in more detail, tweaking out their individual stories of heroism, bravery and devotion to duty no matter what price they had to pay. He also offers a unique flavour of what everyday life was like for the local community, by looking through the local newspapers of the day. A growing paranoia among the masses is addressed, as are the important roles of women, who were keeping the country on top form, whether delivering mail, driving a taxi or working in a local factory, while their husbands, brothers, uncles, sons and fathers were off fighting the war. 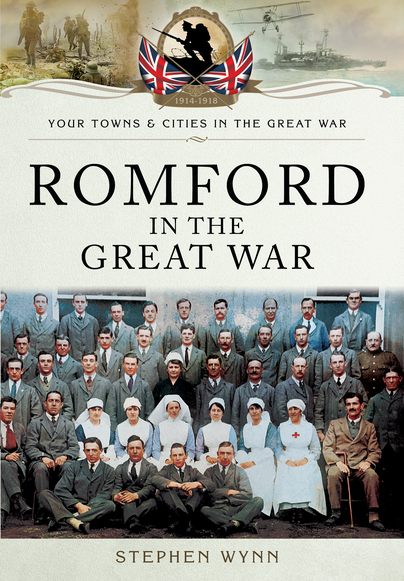 This is a superb account of the people of Romford's outstanding determination to see the war through. Part of the popular Towns & Cities in the Great War series. This volume tells the story of Romford in Essex and the surrounding areas. Romford has a considerable military connection during the war and was associated with the famous Sportsmans' Battalions, the 23rd and 24th Royal Fusiliers, and the Artists Rifles. The author offers a flavour of everyday life in the area and covers the various roles of women who stepped up to take on the tasks vacated by their men going off to war.